I was looking through my 'labels' and noticed that this is my 50th bento lunch packed in one of our favorite lunch boxes, Trudeau Fuel Everest. Surely there have been many more lunches or snacks I have packed in them which I did not blog about. These boxes are very reasonable in price and they last for years, we have been using ours since Nikolai was in Kindergarten and they are still in very good condition after so many years. If you like to get ideas from my lunches in this box, go over to my 'labels' where you will find them under 'fuel box'. I have also written a review of these boxes last year which can be found here. We love Paris and I am hoping that we can visit there again sometime soon. 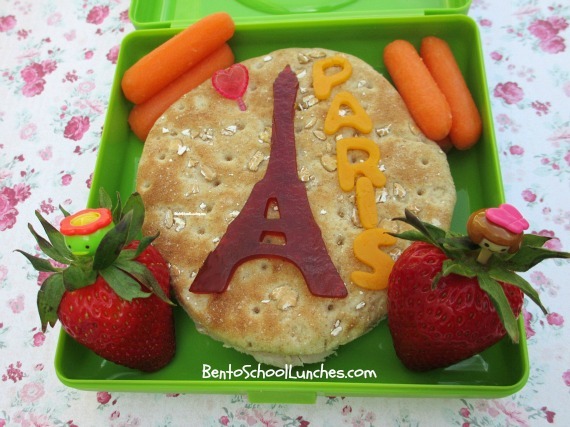 For the meantime, here is a Paris bento that I made today. Whole wheat sandwich thins, Eiffel tower is organic fruit leather cut with a cookie cutter, colby lettering and a heart pick. Organic baby carrots and two large strawberries. Love your lunch, looks bright and so pretty! bentodays, thank you for your encouraging comment! :) Reading your kind comment really makes my day especially a crazy busy one. Love this Patis bento, so beautiful!